MELVILLE, N.Y., April 10, 2018 /PRNewswire/ -- Henry Schein, Inc. (Nasdaq: HSIC) joined the Alpha Omega International Dental Fraternity (AO) to announce that the Alpha Omega-Henry Schein Cares Holocaust Survivors Oral Health Program has received a William J. Gies Award (the Gies Awards) for Vision, Innovation and Achievement for its mission to provide free oral health care to Holocaust survivors living in poverty across North America. R. Bruce Donoff, D.M.D., M.D., Dean, Harvard School of Dental Medicine, presented the program with the 2018 Gies Award for Achievement – Public or Private Partner during the 11th Annual Gies Awards Gala held recently in Orlando, Florida. The award was accepted by the program's co-founders, Avi Wurman, D.D.S., AO Past International President and Program Co-Chair; and Allison Neale, Director, Public Policy, Henry Schein, Inc. 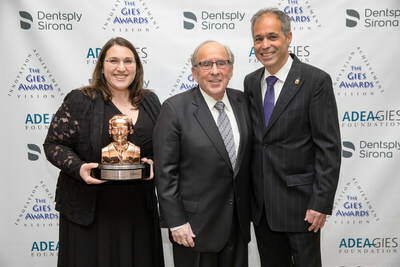 The Gies Awards—an initiative of the ADEAGies Foundation®, a philanthropic organization dedicated to enhancing the oral health of the public by funding programs that support innovations in dental education, research, leadership and recognition—honor people and organizations that exemplify the highest standards in oral health and dental education. Henry Schein, Inc. was previously recognized with the Gies Award for Achievement – Public or Private Partner in 2014, and remains the only company to receive an award since the event's inception in 2007. The Alpha Omega-Henry Schein Cares Holocaust Survivors Oral Health Program was launched in November 2014 in response to the White House's call to action to help Holocaust survivors age with dignity and respect. Since its inception, it has provided free dental care to nearly 1,000 Holocaust survivors in the U.S. and Canada. The program fills a critical need for many of the 100,000 Holocaust survivors living in the U.S., one third of whom live in poverty. Survivors often have special oral health needs, as many suffered from prolonged nutritional deprivation and had little to no dental care access as children during World War II. Care recipients are identified by the network of Jewish Family and Children's Service agencies or other identified partner organizations, as well as people of any faith who were victims of Nazi persecution and meet the program's other eligibility requirements. In addition to financial need, patient participation is prioritized by three critical factors: the elimination of pain, restoration of function, and lack of dental coverage. Participating clinicians determine each patient's scope of care. "We at Alpha Omega are honored to stand with our partners at Henry Schein and accept this award," Dr. Wurman said. "It is truly our privilege to work with these incredible survivors and help restore their ability to eat without pain and smile with confidence. This program exemplifies Alpha Omega's values of generosity and kindness and we look forward to working closely with this most deserving population for years to come." AO chapters that participate in the program include those in Atlanta; Boston; Chicago; Cincinnati; Columbus, Ohio; Dallas; Detroit; Los Angeles; Milwaukee; New York City; the New York/New Jersey metropolitan area; Philadelphia; Phoenix; San Francisco; Seattle; the greater Washington, DC, area; and West Hartford, Connecticut in the U.S., and Calgary, Montreal, Toronto, and Winnipeg in Canada. The program also operates at three U.S.-based dental schools: Temple University – The Maurice H. Kornberg School of Dentistry, A.T. Still University Arizona School of Dentistry & Oral Health, and New York University College of Dentistry. "We are honored that the Alpha Omega-Henry Schein Cares Holocaust Survivors Oral Health Program has been presented with the 2018 Gies Award for Achievement – Public or Private Partner," said Stanley M. Bergman, Chairman of the Board and Chief Executive Officer of Henry Schein. "This highly innovative program exemplifies the power of collaboration across sectors—from the more than 475 AO dentists who volunteer their services to the dental schools, social service agencies, corporate partners, and philanthropic donors who are critical to the program's success. This program has had a profound impact on the lives of nearly 1,000 Holocaust survivors, as well as all of the partners who are honored to contribute to their care. Together we are 'helping health happen'." The Alpha Omega International Dental Fraternity (AO) is the oldest international Jewish dental and medical organization. Founded in 1907 at the University of Maryland School of Dental Medicine, AO has expanded into an international community of dental professionals who are guided by the tenets of professionalism, fraternalism, and commitment to Judaic values. With over 100 alumni and student chapters in 10 countries, AO members embrace the spirit of Tikkun Olam, or healing the world through charitable endeavors. As healers, our members strive to make their communities better. For more information, please contact Heidi Weber, AO Executive Director, at hweber@ao.org.